Project obstacles and solutions: The Goose Pond Fish and Wildlife Area Visitor Center is a 7,000 square foot observation center that overlooks 8,900 acres of wetlands and grasslands. Goose Pond was a wetlands restoration project that the Indiana Department of Natural Resources (IDNR) purchased in 2005. 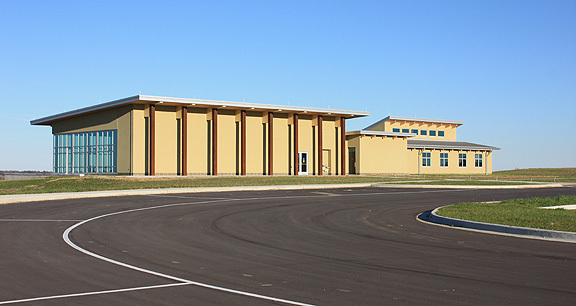 The new center opened on September 22, 2016. It is expected to draw 12,000 bird watchers annually. In addition to its indoor and outdoor observation rooms, the center also houses the offices of the Southwest Region of the IDNR. Wolfe Construction Company was selected as the general contractor for this project. It was very important that the floor of the Visitors Center be durable and easy to clean, but also reflective of the natural setting surrounding the center. The large observation room is surrounded by glass on two sides. An exposed aggregate concrete floor was specified for the project. It used a gravel mix to vary the color of the concrete. This was then polished to a glossy finish. Exposed aggregate concrete can be achieved with a variety of rock, sand and gravel mixes. Each changes the look of the finished floors. IMI did test pours for the DNR to make sure they were happy with the look of the gravel. G,L&E Concrete poured and finished the interior floors. Invision Floor Polishing performed the polished finish on the exposed aggregates. IMI supplied 250 yards of exposed gravel concrete for the inside floors. In addition to this, the center is backed by an outside observation deck complete with a wheelchair ramp. IMI supplied 200 yards of concrete for the exterior deck and sidewalks on this project, as well as the curbs and islands in the parking lot. Rivertown Construction did all of the walks, ramps and curb work. For more information on using exposed aggregate concrete as finished flooring, watch our video. To discuss other decorative concrete options, contact the sales representative for the concrete plant nearest your location. Click here.